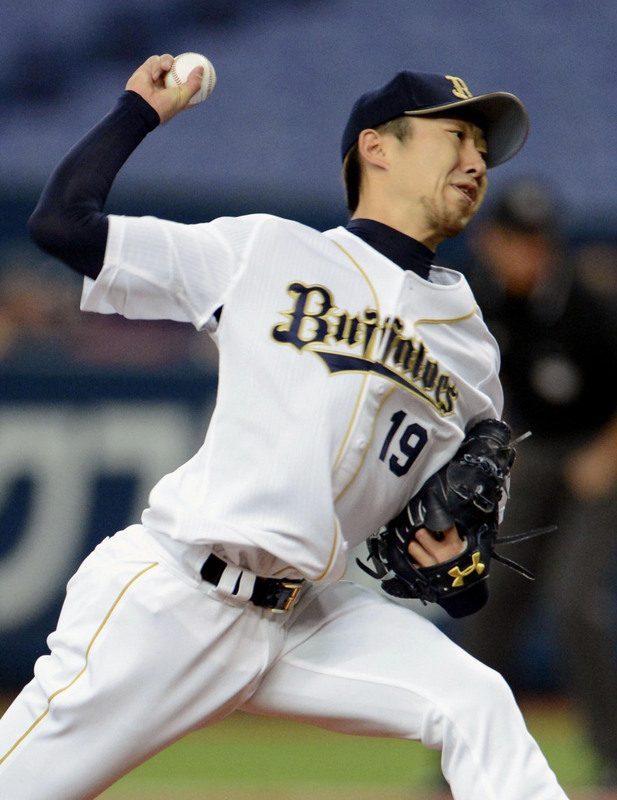 When the “Year of Ma-kun” comes to an end and Masahiro Tanaka collects the hardware likely headed his way as NPB’s best pitcher, there should be at least a little praise left over for Orix Buffaloes pitcher Chihiro Kaneko. Tanaka’s unprecedented run of success — 27 consecutive winning decisions since last losing on Aug. 19, 2012 — and questions surrounding a possible move to MLB have created a news cycle around him that’s not unlike a force of nature in the way it has swallowed up the lion’s share of headlines and attention in Japan. While the spotlight has been trained on the Tohoku Rakuten Golden Eagles’ ace, Kaneko has put up numbers that have been nearly as impressive. Kaneko is 13-8 this season, meager compared to Tanaka’s pristine 23-0, but he leads Japan with 209⅓ innings pitched, 188 strikeouts and has held opposing batters to a .206 average. Tanaka is second in Japan with 205 innings pitched and third with 178 strikeouts, with opponents hitting .220 against him. Tanaka’s 0.95 WHIP is the best in the Pacific League, with Kaneko a few ticks behind at 0.97. Tanaka also has a fielding independent pitching (which measures the variables a pitcher directly controls and is sometimes called a true ERA) rate of 2.24 to Kaneko’s 2.65. The major distinction between the two, aside from their win-loss records, is Tanaka’s teammates have been better than Kaneko’s. Tanaka has been amazing on the mound, but his undefeated mark has been aided by a robust 6.09 run support per nine innings average, while Kaneko has scraped by on 3.04. 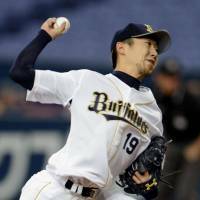 Kaneko gave Tanaka a look at how the other half lives by striking out 11 over nine shutout innings, only to leave with no decision when the Buffaloes failed to muster a single run in support against the Eagles on Sept. 30. Tanaka’s numbers are sexier under the glow of a perfect record, but Kaneko has statistically been right there with him while toiling in the shadows. It’s a start: The Yokohama BayStars won’t produce a winning season, but for the first time in years, the long-suffering Central League club will enter the offseason with tangible improvements to build upon. The BayStars are 62-78-1 (through Friday) and have assured themselves of a fifth-place finish in the CL, snapping a five-year streak of last-place seasons that spanned the eras of three managers. Yokohama will also end the year with at least 60 wins for the first time since a 71-72-1 campaign in 2007. Nowhere but up: Yuki Saito made his first and likely only start of the year for the Hokkaido Nippon Ham Fighters on Oct. 2, finally working his way back from a shoulder injury discovered late in 2012. Things didn’t go too well for the right-hander, who was touched up for six earned runs in four-plus innings against the Orix Buffaloes. It was Saito’s first start since Oct. 5, 2012. Manager Hideki Kuriyama said after the game that he was hopeful Saito could keep progressing and contribute next season. Saito made seven appearances for the Fighters’ farm team before being called up and was 1-3 with a 8.61 ERA in 23 innings. Arms race: Now that Yokohama BayStars manager Kiyoshi Nakahata is assured of being back at the helm next season, the team can get to the task of upgrading its woeful pitching staff. While the BayStars’ 619 runs scored (through Friday) is the highest in the Central League, the team has surrendered 678, the most in Japan. Not surprisingly the club’s 4.54 team ERA is the worst in NPB. All of which means the BayStars are in the market for pitching. A recent report by Sports Nippon mentioned several potential free agents who could be Yokohama targets, including 2009 Sawamura Award winner and former Yokohama High School product Hideaki Wakui of the Seibu Lions. Other names mentioned include Kenshin Kawakami, recently released by the Chunichi Dragons; Hokkaido Nippon Ham’s Brian Wolfe; and Hisanori Takahashi, who has spent parts of four seasons in the majors and is currently with the Colorado Rockies’ Triple-A team.